BP is to sell assets in Texas, Canada and Egypt, to part-fund the clean-up cost of the Gulf of Mexico oil spill. The oil giant said it had reached a $7bn (£4.6bn) deal with US-based oil production firm Apache Corp. The proceeds will go towards a fund set up to pay for clean-up costs and claims for damages resulting from the spill. The BBC has also learned that BP will sell assets in Pakistan and Vietnam over the next 12 months. Analysts value the oil and gas wells and exploration sites at between $2bn and $4bn. Meanwhile, US incident commander Adm Thad Allen said BP could continue a pressure test of the well for another 24 hours, saying it appeared stable. He said five small leaks had been found around the well, which has been closed in for the past five days using a new cap, but that they were more like "drips" than a serious concern. "We've found nothing that would be consequential toward the integrity of the wellhead to date," Adm Allen told reporters at a briefing in Washington. He said the US government and BP were continuing to discuss the possibility of a so-called "static kill" - an operation to pump drilling mud and cement into the well to stop the flow. BP chairman Carl-Henric Svanberg said the deal with Apache was the first sale of assets to help pay for the spill. BP has already spent some $4bn on efforts to contain and clean-up the oil and compensate those people affected by it. The comany said the assets sold included oil fields and gas processing plants in Texas and south-east New Mexico worth $3.1bn and BP's upstream Western Canadian gas business for $3.25bn. The deal also included oil exploration and production assets in Egypt worth about $650m. BP's share of the Prudhoe Bay oil field in Alaska was not included in the sale to Apache, contrary to earlier media speculation. The company had also been thought to be looking at a sale of its majority stake in its subsidiary Argentine Pan American, which operates in Argentina, Chile and Bolivia, and is thought to be worth about $9bn. Prime Minister David Cameron's visit to the US comes amid questions over BP's involvement in the release of Lockerbie bomber Abdel Baset al-Megrahi. 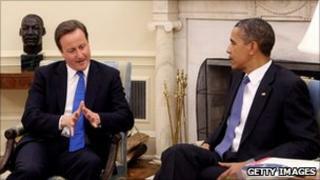 Speaking after a three-hour meeting with President Barack Obama, Mr Cameron condemned the decision to free Megrahi, a terminally-ill cancer patient, but rejected suggestions that a lobbying effort by BP had influenced it. "That wasn't a decision taken by BP - it was a decision taken by the Scottish government," he said. Mr Cameron earlier met US congressmen who have accused BP of lobbying the previous British government to arrange the release because of its business interests in Libya. The company denies the charge, although it admits that it did call on the government to facilitate a general prisoner transfer agreement with Libya, of which Megrahi's release formed a key part.